Tropical Pitcher Plants are beautiful carnivorous plants that flower all year round. As the plant grows, some of the leaves become modified, forming large flasks known as pitchers. These containers rest on the ground, and the pitcher may reach up to 14 inches high and 7 inches wide. The pitcher can hold up to four cups of fluid. The thick stem grows along the ground and may reach up to 20 feet in length. The thick leaves appear leathery and they have with a wavy outer margin. The edge of the mouth of the pitcher has a highly distinctive wavy lip, and the outside of the pitcher is purple. The inside is more yellowish in color. The lid of the pitcher is very large and arches over the pitcher. 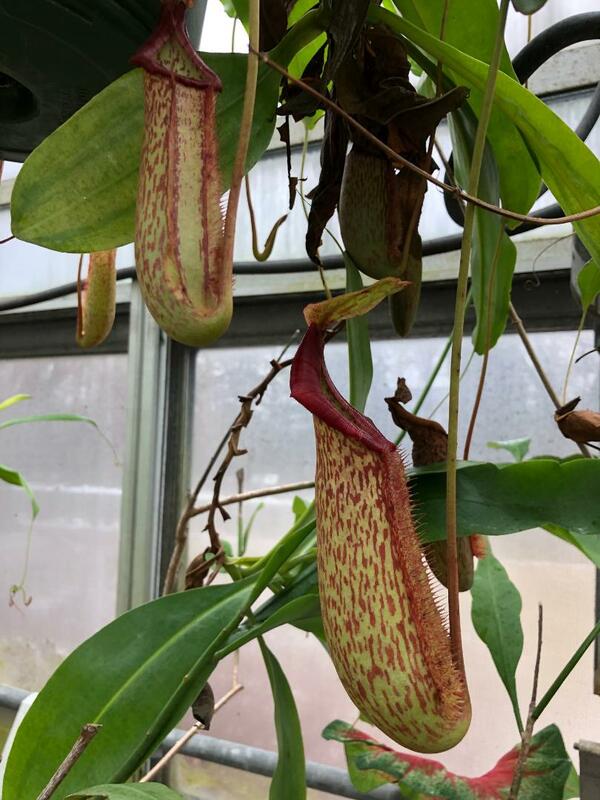 Insects are attracted to the plant by a fragrant odor but the waxy surface of the pitcher lip does not provide support, and the plant’s victims tumble into the fluid below. A powerful digestive acid is then released from the pitcher walls, which consumes the prey. In addition to insects, the gigantic pitcher is said to capture rats, frogs and lizards. Their pitcher smells can range from sweet to musty. Open grassy areas where the soil is loose at a height of between of 1 to 2 miles above sea level. This particular pitcher plant is known to be native only on Mount Kinabalu and Mount Tamboyukon in Sabah, on the island of Borneo. Carnivores – they eat mainly insects but larger plants may eat small rats, lizards, and birds. Flowers are formed on a branched flower stem. The flowers have a strong sugar smell and are brownish-yellow in color. The male and female flowers grow on separate plants. They are insect-pollinated, the primary agents being flies, moths, wasps, and butterflies. Seeds are typically produced in a four-sided capsule, which may contain 50 to 500 wind-distributed seeds, consisting of a central embryo and two wings, one on either side.